Eric J Velazquez, MD, Elizabeth Renza, MD, Ashutosh Kaul, MD. Department of Surgery. Westchester Medical Center, Valhalla, New York. 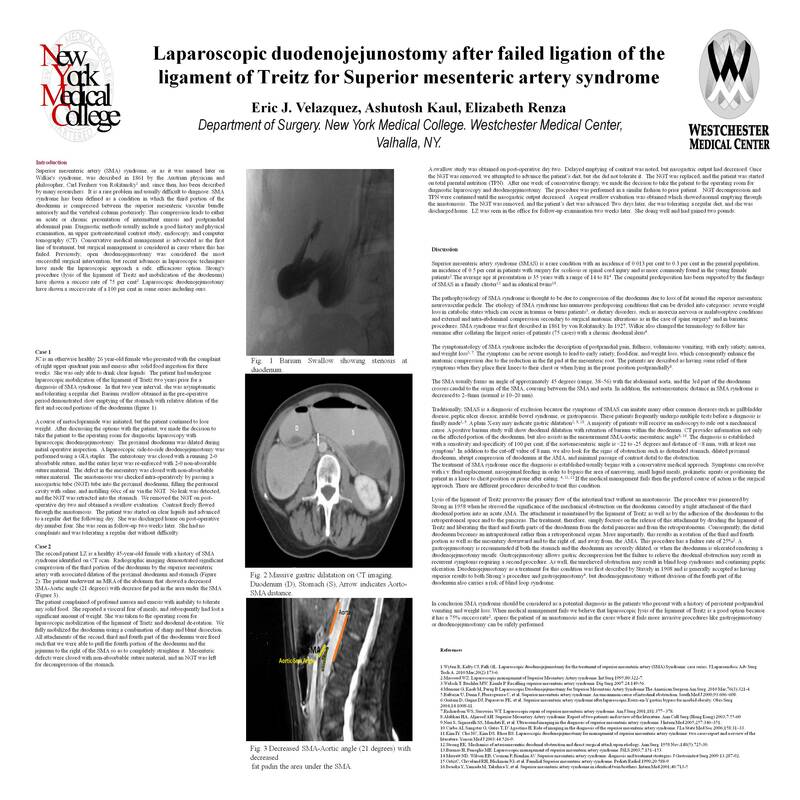 Superior mesenteric artery (SMA) syndrome is an atypical, rare cause of both acute and chronic high intestinal obstruction secondary to extrinsic vascular compression. Symptoms usually are postprandial epigastric pain, eructation, fullness, and vomiting. Symptoms are caused by compression of the third portion of the duodenum by the SMA. When nonsurgical management is not possible or the problem is refractory, surgical intervention is necessary. To evaluate the role of laparosopic lysis of the ligament of Treitz as a less invasive option in the presence of SMA syndrome that does not improves with medical treatment. In this article, we report a case series of SMA syndrome in 2 patients who failed conservative treatment. These two patients underwent laparoscopic lysis of the ligament of Treitz to later on require reintervention in the form of laparoscopic duodenojejunal anastomosis due to recurrence of symptoms. Of the patients presented 1 of them (50%) remained asymptomatic for 2 years after laparoscopic lysis of the ligament of Treitz. Both of the patients had excellent response to laparoscopic duodenojejunostomy measured by non recurrence of the symptoms. We believe that laparoscopic lysis of the ligament of Treitz is a good option for treatment of SMA syndrome because it has a 75% success rate, spares the patient of an anastomosis and in the cases where it fails more invasive procedures like gastrojejunostomy or duodenojejunostomy can be safely performed.